Connecticut Commentary: Red Notes from a Blue State: Another Day, Another Crony Capitalist: Where Is The Republican Populist? Another Day, Another Crony Capitalist: Where Is The Republican Populist? Managing Editor of the Journal Inquirer Chris Powell may be right. Even on their best day, Republicans running for office do not know how to frame an issue so that it will appeal to those not born to the purple. A story written by Steve Collins of the Bristol Press provides a case in point. Governor Dannel Malloy had just disbursed $10 million in urban tax credits to ESPN, a well-known and prosperous sports broadcasting network that very likely did not need a handout from Mr. Malloy. That message may not have reached Mr. Collins' desk. But it is plain from the line quoted above that, if such a message was pressed upon him by Mr. Malloy’s well-oiled communications machine, he was not convinced that the $175 million project easily might have gone forward without Mr. Malloy’s $10 million contribution. ESPN is a big boy, not a bumbling upstart operation. We should all send up a rousing cheer in praise of media skepticism. All the politicians present at the cable cutting were taking political campaign bows. 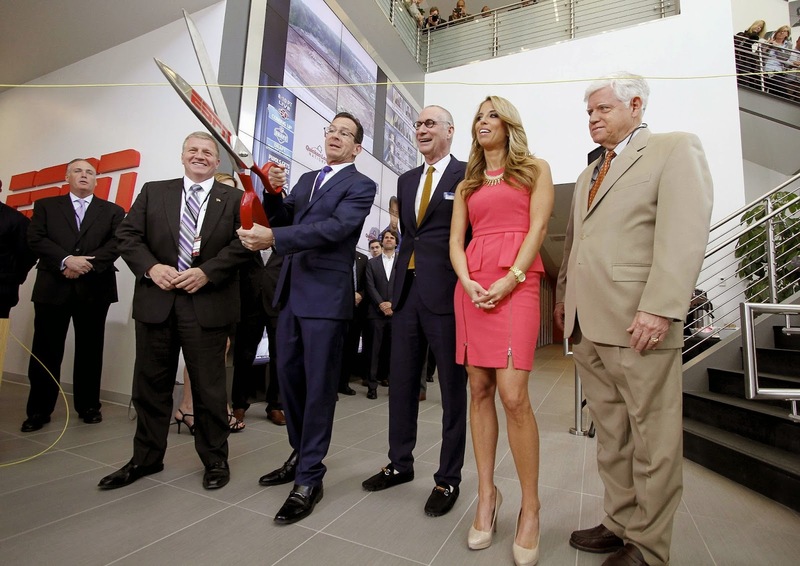 Present at the opening of ESPN’s new “Digital Center-2, a 194,000 square foot, five-studio facility in Bristol, were Bristol Mayor Ken Cockayne, ESPN president John Skipper of the SportsCenter, Governor Malloy, shown cutting the cable with a massive scissors, and U. S. Representative John Larson of the impregnable 1st District. The “great day” occurred, it will be noticed, within the context of an election period. The Democratic and Republican nominating conventions had been concluded days earlier. It is difficult to tell here who is putting the lipstick on which pig, but it looks like ESPN is doing Governor Dannel Malloy the favor. ESPN gets tax money the company did not need to open a facility that would have opened without Mr. Malloy’s unnecessary contribution, and Mr. Malloy takes a campaign bow freighted with meaning. The meaning will be spun out by Democrats across the state in the upcoming elections: Democrats are doing things to maintain prosperity and jobs – don’t forget jobs –during the malingering Bush recession. What is the real meaning of the bow? Where does the money given by Mr. Malloy to ESPN come from? Who benefits from Mr. Malloy’s magnificent gesture? Would Mr. Larson, running in a district last won by a Republican in 1957, have been re-elected to office had he not participated in the ESPN festivities? Will women owners of nail salons benefit from Mr. Malloy’s redundant generosity? When Mr. Malloy imposed on Connecticut the largest tax increase in its history, Nail Salons appeared on a list produced by the Yankee Institute showing companies and people hit by Mr. Malloy’s new taxes. None of the companies or people represented on that list were present at the ESPN cable cutting. Indeed, no person or company represented on a Yankee Institute list showing Connecticut’s 371 sources of revenue was within camera range when Mr. Malloy took his campaign bow. But this is where Mr. Malloy’s unnecessary $10 million tax giveaway to ESPN came from. And every dollar Mr. Malloy and the Democratic dominated General Assembly has appropriated from one of the state’s 371 separate sources of revenue is a dollar that otherwise might have been used to expand a business or produce a job or increase a salary of someone in Connecticut who is not employed by ESPN. So then, here we are: Big Government has given Big Business Big Tax dollars appropriated from the Little People. And what do Republicans running for office this year say about it? Where are the populist Republicans among us who might be able to mold a message from all the data laboriously assembled by the Yankee Institute that would appeal not to Fairfield based plutocrats – but to women who work in Nail Salons? Really, where are they? Their state is in desperate need of them. What has made them swallow their tongues? Where are the populist Republicans among us? Again, I hunch that the problem here is that the Republican Party was the party of the established WASP, the Volvo liberals before Volvos were around. As noted, Lowell "The Maverick" Weicker got his votes in 1988 from places like Greenwich. The abused working people of the State have not yet figured out that the Republican Party is on their side, or at least not hostile like the New Left Democrats in charge. We here in Connecticut may depend on outside forces to open our eyes and show us the way back to constitutional self-government. Dr. Ben Carson is not a complete outsider, having graduated from Yale. And, he and his wife look a far sight more dignified than Malloy when cutting ribbons.